The “Forward Order” feature is exclusive to Travel Money Club and allows members to automatically buy currency when their target exchange rate is reached. They simply tell the us what currency to buy, what exchange rate to buy at, and the payment card to use. Then if and when the target exchange rate is reached, we automatically execute the order and deliver next business day* (for orders completed by 1pm). As it all happens in the blink of an eye, even if your target rate is only achieved for a couple of minutes, we will still execute your order! Please disregard the spike shown on the chart. This is called an out-trade, picked up on the computer but not actually real. It occurred at 8pm on Monday 1st January. Thin markets on bank holidays can trigger this type of false movement. The real story is more mundane. Strong economic performance from Europe, against a weaker US Dollar, and although Cable (GBP/USD) reflects dollar weakness, actually the Pound against the Euro is lower. Brexit drags on. There’s been a lot of ‘news’ in the UK about Brexit and a possible cabinet reshuffle. Keep an eye out for more Brexit news. We can expect more of this as 2018 progresses. Events for the coming week to watch out for. Wednesday 3rd January 3pm US Manufacturing PMI. Friday 5th. 1.30pm US Non-farm payrolls. 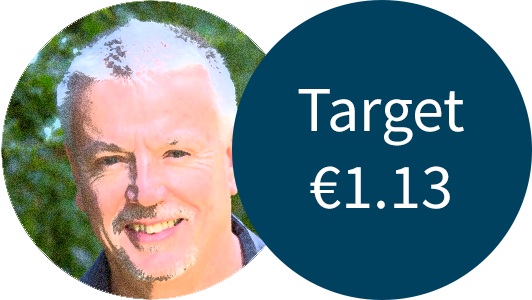 Suggested level to buy holiday Euros. 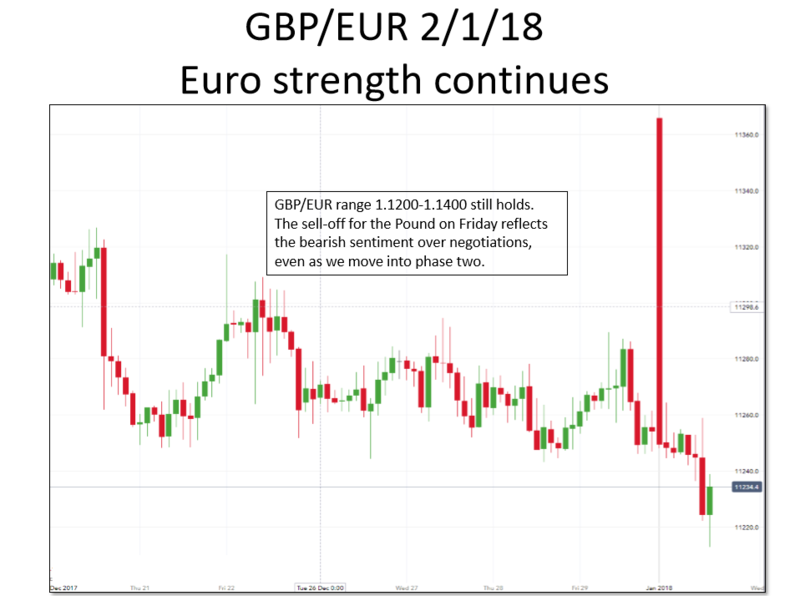 Sterling a shade weaker against the strong Euro, so we would still suggest a range of GBP/EUR 1.1150-1.1350, with 1.1300 looking like a good opportunity to buy Euros. Remember, breaking news moves markets! Disclaimer: Opinions expressed are solely those of Derek Taylor and do not necessarily express the views or opinions of the Travel Money Club or any other organisation mentioned herein. These opinions are not intended to be a source of advice and any action taken as a result of this information is entirely at the reader’s own risk. Derek is Director and Co-Founder of the Travel Money Club, as well as CEO of Taylor Associates (International) Ltd, one of the City of London’s foremost financial and market training organisations. Taylor Associates was established in 1993, specializing in derivatives, capital markets, risk and treasury training. He has personally trained in banks, brokers, asset managers, hedge funds and corporations both in the UK and overseas. Derek’s career started in Midland Bank Group Treasury working across a broad product range including Money Markets, Foreign Exchange, Equity and Fixed income. He rose to the level of senior Director, before moving to Lehman Brothers, and then Bank of America working both in London and NY. Derek has primarily worked as a trader, both inter-bank and proprietary, but has also spent some years as an inter-bank broker, running desks at two of the world’s leading brokerage houses, Tullett Prebon and Harlow Butler Savage (now part of the ICAP group). Derek is a frequent speaker on Financial Markets subjects all over the World, and is an Associate of the Chartered Institute of Bankers (ACIB), a member of the Forex Association (ACI), and a member of the Society of Technical Analysts (MSTA). * Please note that a small number of currencies are not available for next business day delivery. The actual delivery date will be clearly displayed in your order acknowledgement. 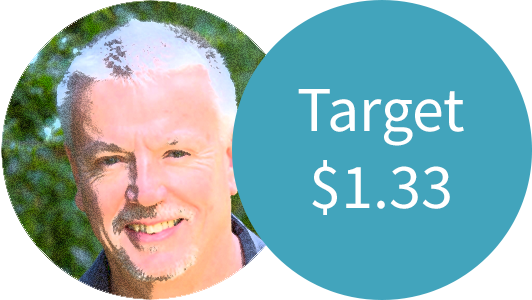 Derek Taylor, our very own foreign exchange expert, is recommending that Travel Money Club members buying US Dollars this week should target their “Forward Orders” at $1.3300 for a great deal.